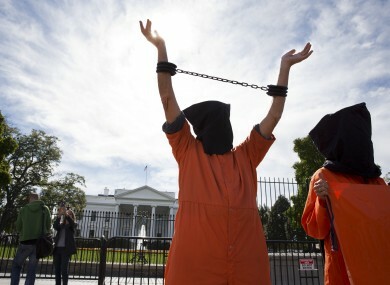 People protesting against indefinite detentions at Guantanamo Bay. THE DEPARTMENT OF Foreign Affairs has denied that Shannon Airport was used by the CIA for the purposes of transporting prisoners who were tortured. Yesterday a report was released detailing how brutal the CIA’s interrogation of terror suspects was in the wake of the 9/11 attacks. The document does not identify specific countries where interrogation or detention took place, nor countries through which prisoners were transferred. However, last year a report compiled by the Open Society Foundation found 54 governments – including Ireland – facilitated the CIA’s rendition program. A spokesperson for the Department of Foreign Affairs told TheJournal.ie that Ireland “does not tolerate and will not tolerate the use of our airspace or airports for any illegal purpose, including torture, rendition or the unauthorised detention of any individual”. The spokesperson said “no information or evidence has previously been provided to substantiate any assertion that Ireland has permitted such activity or that any person has ever been subjected to extraordinary rendition through Irish airspace and airports”. The Government has on several occasions made clear to the US Authorities that it would be illegal to transit prisoners for rendition purposes through Irish territory without the express permission of the Irish Authorities, acting in accordance with Irish and international law. The US Authorities, for their part, have confirmed that they have not done so and that they would not do so without seeking the permission of the Irish Authorities, which would not be forthcoming for any purpose which would not be consistent with the provisions of Irish and international law. Email “Department of Foreign Affairs: Shannon Airport was not used to facilitate torture”. Feedback on “Department of Foreign Affairs: Shannon Airport was not used to facilitate torture”.